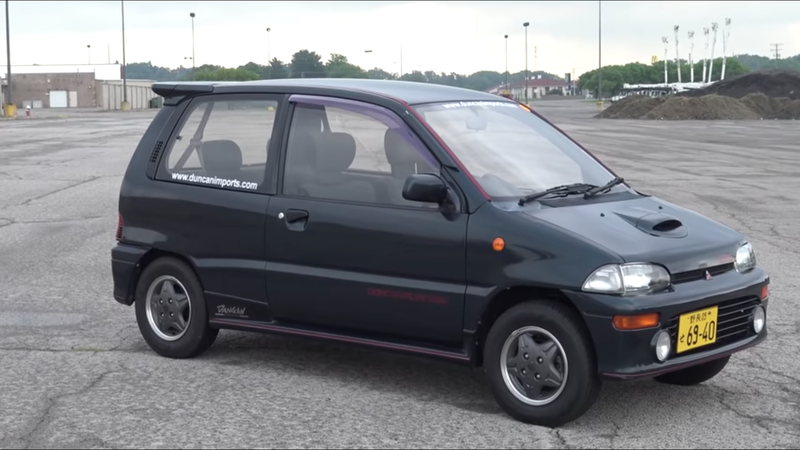 Japanese carmakers never brought their great kei cars of the 1980s to America, and for years we’ve always assumed that they’d have just been too small and too frail for our highways. But now they’re legal to import and people are coming to discover that interstates and keis do mix. This is the Mitsubishi Minica Dangan ZZ, probably the most adventurous of all of the hatchback kei cars. It was like a mini hot hatch, but it was also a technical showcase for Mitsubishi, which was rapidly expanding in the Bubble Era, much to the jealousy of other Japanese carmakers at the time. At least that’s what I’ve heard talking to engineers at Mazda, who were also on an unbelievable new car kick back in the day. The standout feature of the Dangan ZZ was that with its debut in 1989 it was the first production car with five valves per cylinder. This beat Ferrari to the punch. This. This tiny kei making 64 horsepower. It did it with three cylinders and a turbo from initially 548 and then 657 cc once kei car regulations changed in 1990. Tom’s Turbo Garage notes that the car got 45 mpg even with aircon on, going up and down the Appalachians, and it cruised at about 4200 rpm at 62 miles per hour. So an old kei isn’t necessarily incompatible with American roads. This is bad news for my bank account, which is periodically threatened with losing four or five grand in the form of a Honda Beat. Now, this Dangan ZZ is actually a car that you could buy. Tom’s Turbo Garage borrowed it from our friend Gary Duncan, who runs the most incredible and almost unbelievable car import business/car collection in the country. Look up its listing here, if you’re curious. You’ll find little reason why you shouldn’t own this historic, surprisingly usable car. 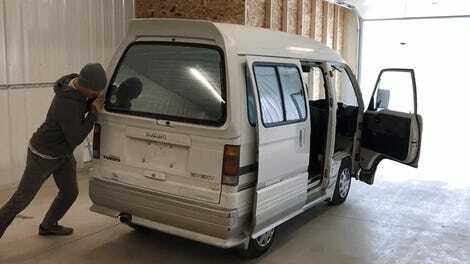 LoneStarDrift also did this in a Kei van!